There are occasions when information must be shared between customers or coworkers, and if files are too large to email, using CD's to share data is another option. Durable, reduced glare polypropylene protects your CDs from scratches and dust! 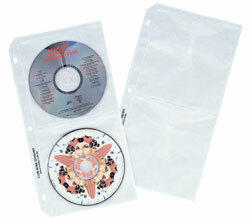 Simply peel off adhesive backing, affix to a clean surface, and store your CD for easy access. Easy to adhere to a book, binder, or file folder. Perfect for reports, presentations, proposals, research papers and more. 10/PK.